Mariner East 2 pipeline construction in Chester County. 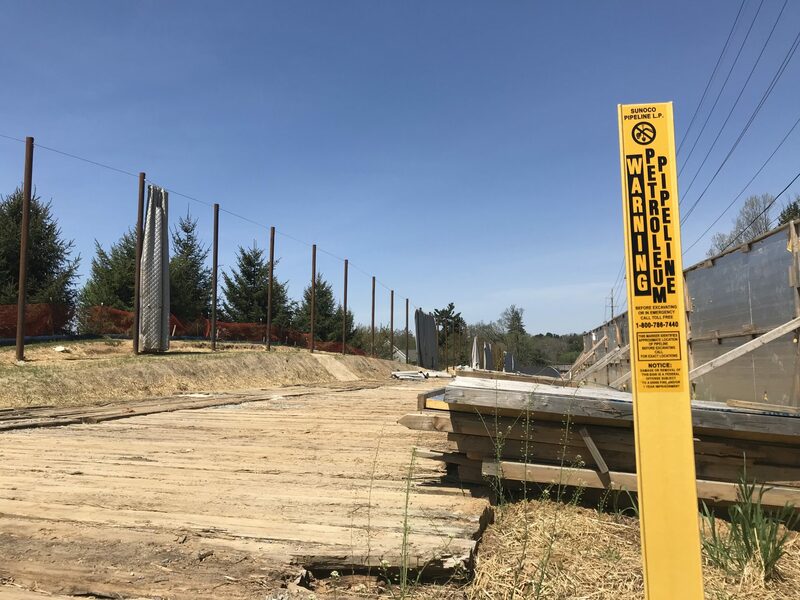 Investigators at the Pennsylvania Public Utility Commission said on Tuesday they didn’t confirm that the 12-inch pipeline component of Mariner East 2 was safe, despite a statement by Sunoco that they had done so. The PUC’s Bureau of Investigation and Enforcement contradicted a claim by Sunoco in the company’s response to seven eastern Pennsylvania residents who filed an emergency petition to the regulator to shut down the Mariner East project. The bureau issued its denial in an intervention to the residents’ case before the PUC, for the limited purpose of clarifying its position on whether the 12-inch line is safe. Still, the bureau stressed that the filing doesn’t mean that it thinks the pipeline is unsafe. “The purpose of this clarification should also not be construed as a testament that the 12-inch line is unsafe,” it said. The filing said Sunoco based its statement on a letter from Paul Metro, head of the bureau’s safety division, to three school district superintendents on Nov. 1, saying that no leaks were discovered in two tests of the 12-inch line. But Metro’s letter did not mean that the pipeline was characterized as “safe,” the bureau said. “Rather, Mr. Metro stated that it was the responsibility of the I&E Safety Division to monitor and enforce compliance with state and federal regulations while it is ‘Sunoco’s responsibility to operate and maintain their pipeline facilities in a safe manner,’” the bureau said. On Wednesday, Sunoco said it regretted any confusion caused by its comments on the Metro letter, and would amend its answer to the petition to remove its characterization of the letter. “SPLP believes and argues that the 12-inch line is safe, and that the Metro letter is consistent with that position,” the company said in a letter to the PUC. It also argued that the safety of the 12-inch line was not an issue in the hearing before Judge Barnes, and that the petitioners presented no evidence at the late-November hearing that the line was unsafe. The safety of the 12-inch line, which was built in the 1930s, has been a focus of Mariner East opponents because of its age and history of leaks, most recently of 33,000 gallons of gasoline into Darby Creek near Philadelphia in June. A section of the pipeline in Delaware and Chester counties is being temporarily repurposed to carry natural gas liquids as part of the Mariner East project so that Sunoco can start to meet customer orders with the long-delayed pipeline. Sunoco says it will start operating Mariner East 2 by the end of 2018. In its filing, the bureau also noted that Sunoco’s statement had been used by PUC Administrative Law Judge Elizabeth Barnes in her denial of the emergency petition on Dec. 11, and said it wanted to clarify its position in case the statement factored in to her decision. The clarification was also intended for the full PUC when it reviews a formal complaint by the petitioners for a full hearing on their request for a halt to the construction of ME2 and the operation of Mariner East 1, the bureau said. “To the extent that this portion of Sunoco’s argument was given any weight by ALJ Barnes in reaching her conclusion, or to the extent that the Commission may rely upon this portion of the December 11 order in its review of the material question, I&E provides the within clarification,” the filing said. Sunoco, in its letter to the PUC on Wednesday, argued that its answer to the petition — containing the disputed characterization of the Metro letter — was not introduced into evidence at the Barnes hearing and was not referenced in testimony. Therefore, Sunoco “does not believe” that the judge relied on that part of the company’s answer in deciding to deny the petitioner’s request, the company said. In November, Sunoco spokeswoman Lisa Dillinger told StateImpact that the 12-inch line had a $30 million upgrade in 2016; she did not specify the improvements to the line. She also said the integrity of the ME1 and ME2 pipelines has been verified by the PUC and by PHMSA, the federal pipeline regulator. Last week, the bureau raised questions about the safety of Mariner East 1, another 1930s-era pipeline that is already carrying natural gas liquids across the state to a terminal at Marcus Hook near Philadelphia. In a formal complaint, the bureau blamed corrosion for a leak of about 20 barrels of the liquids from ME1 at Morgantown, Berks County in April 2017, and said it had “statewide concern” about corrosion in the pipeline. Despite concerns about the safety of the 12-inch line, an independent consultant working for West Goshen Township in Chester County said in a report issued Tuesday that he had found no problem with the approximately one mile of the pipe that runs through the township. The pipe meets federal requirements for a number of standards including leak detection and automatic system shutdown, said the consultant, Richard Kuprewicz of Accufacts. About half of the pipe in the township has been replaced with pipe dating from 1968 or newer, he said.